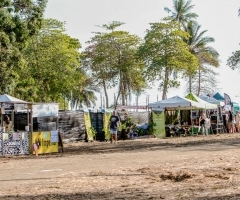 The last of Jungle Jam 2017 was upon us, and everyone woke up to amazing weather, good vibes, and everlasting memories from the last few days in paradise. With Day 3 being a shorter day, most flocked to the festival a little earlier to enjoy the most music in the smaller amount of time. Some participated in morning beach yoga, others chose to explore the beach town of Jaco for the last time before their flights around the world coming in a few short hours. Day Three's afternoon energy was equal parts R&R and rave dancing, with Featherwolf and Talawa riling the crowd with rivoting passion. The Sunday morning slump quickly evaporated, to say the least. 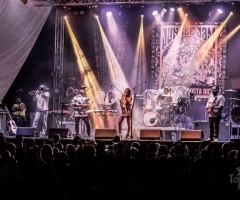 As Talawa finished their set on the main stage, Mike Love and friends teamed up with Costas Verdes, an organization promoting the planting of trees along the Costa Rican coastlines. With shovels and twine in hand, many planted baby trees with love for the planet, and afterward experienced a heartwarming a cappella performance from Mike Love and bandmates on the beach. The song they sang was written for the sole purpose of preaching world change, and all were in tears who happened to overhear it. 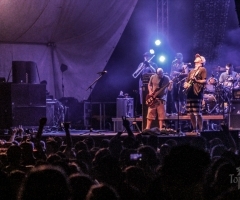 Mike Love was then called into duty for their second set of Jungle Jam 2017, joining Mahali on the side stage until Zach Deputy took over (also performing set number two). 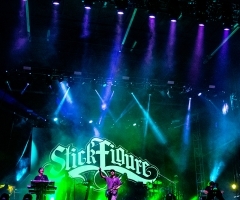 Closing down the 7th Annual Jungle Jam was Stick Figure, who took the stage with bombastic fervor and delivering a truly once-in-a-lifetime performance. Until next year, Jungle Jam attendees returned home enlightened, cherishing the 72-hours of pure festival fun. See the highlights of Day Three above, and stay tuned thorughout the coming year to be the first to know about the 8th Annual Jungle Jam line-up for March 2018.